"Whether or not the national economy is in recession -- a subject of ongoing debate -- is almost beside the point for some states," said the report to be released Friday by the National Conference of State Legislatures. 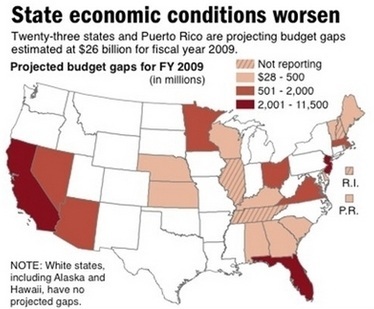 By mid-April, 16 states and Puerto Rico were reporting shortfalls in their current budgets as the revenue those budgets were built on -- typically, taxes -- fell short of estimates. That's double the number of states reporting a deficit six months ago. - More than half the 16 states reporting deficits this year have cut spending, including $1 billion by Florida lawmakers last year and across-the-board cuts in Nevada. At least eight states are debating raising taxes or fees, including a proposed $1-per-pack cigarette tax increase in Massachusetts to raise $175 million. - Twelve states, including Georgia, Idaho and Illinois, reported that personal income tax collections were failing to meet estimates, and in eight of these, collections were even below a reduced forecast. - Many states, including Alabama, Arizona, Massachusetts, Minnesota, Nevada and Wisconsin, plan to tap their rainy day funds, which contain money set aside for fiscal emergencies. Nevada may use its entire rainy day balance.